It’s played out in a similar fashion over the past several hunts, an early-flushing rooster pheasant rises unexpectedly at the start of a walk, cackling into the air with wings whirring, shocking me into shooting mode. In the slightly warmer days that have passed into the recent history of this year’s hunting season, I’ve found my success as I’ve set into the field, picking up one or two birds in those transition areas between the deep, frozen sloughs which usually provide cover for pheasants this time of year and the light grass along the harvested edges and approaches to the lands I hunt. In all but one of those recent hunts, those early connections are the only shots I’ve gotten in my entire wanderings for the day. Perhaps it’s a function of that first shot, echoing out over the December landscape, alerting all those other birds as to the danger that is approaching. Maybe it is part of a grand scheme to keep the holiday weight off by adding some extra resistance on the walk. However, as I try to add it all up and wax metaphysical about the hunt and what it means, I get the feeling that the bird in my pouch, as I go up the hills and down, through cattails and brush, is a reminder of how lucky I am to be hunting, even in the trough of low numbers, and the challenge of late season. As my brother-in-law and I set into a nearby WMA, we watched three colored birds scatter into the grassy edge along a small draw. As a guy who sometimes needs a spurring to get going, he was the one whispering-shouting to me through the open truck doors – “let’s go, let’s go!” – as the roosters disappeared into the cover. I assured him they’d still be there as I uncased my gun, donned my vest, packed a water bottle, readied my dog’s collar and only then, finally turned Ole loose on their scent trails. I crept to the edge of the small valley and watched my lab rumble into the brambles, sending a rooster zipping to my right. With a point and click, my only shot of the day reverberated through the draw and the bird crumpled in mid-air and tumbled hard into the grass. I saw it bounce, get its bearings and sprint up the hill. I watched in dismay as my dog stalled halfway up the incline in his pursuit while the rooster disappeared into the golden grass over the small rise. Taking Ole to the spot along the fenceline where the rooster ran, I observed in helpless frustration as he found a scent trail which ran fifty yards through the sparse grass, but no bird came to be. Thinking all was lost, I turned to my brother-in-law for a pointed field conversation about runners and searching and where we would be headed next when the rooster didn’t turn up. I looked down the draw and back up the hill to see Ole standing over an oddly-shaped pair of grasses that looked a lot like tailfeathers. Sure enough, while I turned away to express my dismay, he had found the bird somewhere in the mix of low brush and light grass at the edge of the hill, and with a little praise, we were back on the trail. It wouldn’t be long and the next rooster of the trio flushed, and in the snap-hunting method of a seasoned grouse man born and raised in the woods of Minnesota, my brother-in-law put the second bird down before it managed its third wing-beat. It was an easy find for Ole and the three of us set off. The third bird in the roadside group never materialized, but a wise rooster a quarter-mile in made haste, putting a large bush between my dog and I and what would have been an easy shot. Up and over the large hills we went, with tailfeathers sprouting up from our vests and wagging in our faces. I tip-toed through the draws of icy trails made hard from the feet of moving deer and the recent melting and re-freezing in the area with cattails poking at my face as Ole plowed his way through. Occasionally, far off wingbeats would sound like a small engine, and the silver silhouettes reflected the light of the late afternoon sun as a rooster or hen would disappear over the next rise. Approaching the end of the draw along a cut field, we sent seven or eight birds into the air sixty yards ahead of us, just beyond the edge of our range. 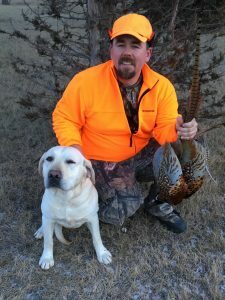 All along the walk with scattered hens in the brush and far-flushing roosters, I felt the weight of the white-spurred bird in my game pouch, an early take on a late season hunt and a reminder of my responsibilities as a hunter and sportsman. The thought of the kill lingered with me, as it sometimes does in the quiet reflection when passing through those still areas where the dog gets no scent, and we wander toward the next likely-looking stretch of habitat, and the weight seemed to grow heavier. As I often do, I pushed that brooding thought out of my mind as the sun started to set behind us on the windless trek back to the truck. Like the snowy hunt two weeks ago, and last weekend’s tromp through the cattails, and the lone rooster taken the day before, I unloaded the bird collected in the first few moments of the day’s adventure; content to have had the opportunity, and the walk that followed through the thoughts and observations along the hills of the small creek valley turned purple by the last light of the day. All the way, our early take meant success – and many other things – even if we never fired another shot on the late season walk…in our outdoors.